Crown gall is the only serious bacterial disease that affects roses. It is found worldwide attacking some 140 plant genera in 60 different families, including rosa. Crown gall is caused by the bacteria, Agrobacterium tumefaciens, which is found in most agricultural soils. Simply stated, crown gall reduces the productive life of plants. Trees and woody ornamentals seem to be the plant groups most affected by crown gall. Target plants in Texas include apple, blackberry, euonymus, fig, grape, peach, pecan, pear, pyracantha, rose and willow. At my country home in Navasota, Texas crown gall infected a crape myrtle tree estimated to be 100 years old. Also known as crown knot, root knot, root gall, or simply “gall”, crown gall is a tumor-forming disease. It is much like tumors in mammals, although there is no relationship between crown gall and animal cancers. It is a disease that has been extensively studied by scientists in their search to understand cancerous growths. Once crown gall is identified, the plant may live many years but could become a distribution center for the bacteria if action is not taken. Symptoms. In roses, tumor-like growths can occur at the soil level (crown), bud union or on the roots. Growths are circular with a rough exterior. Young galls are light colored (usually light green or white), smooth and soft. Older galls become brown or black, hard and woody and eventually crack, decay and slough off. Secondary tumors may develop in the same place the following year. When cutting into a gall, a callus-type tissue is found all the way through the tumor. The portions of the gall closest to the exterior contain the actively growing bacteria. 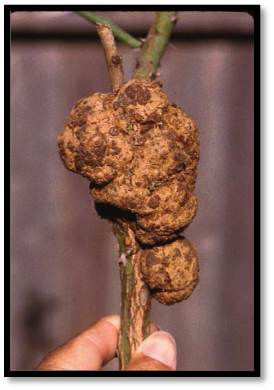 Galls typically form on roses at or below the soil line along the main root – often where the main root was pruned before transplanting (usually in grafted roses). They can also form on lateral roots and on above-ground canes. Galls are perennial and increase in size with plant growth. They can be as small as a pea or as large as a softball and weigh several pounds. Crown gall has the greatest adverse effect on young plants, which may become stunted, fail to produce healthy leaves and exhibit a rapid decline in vigor. Small galls require careful diagnosis because they can be confused with something else (e.g. aerial burr knot, wound calluses, or galls induced by insects, fungi or nematodes). 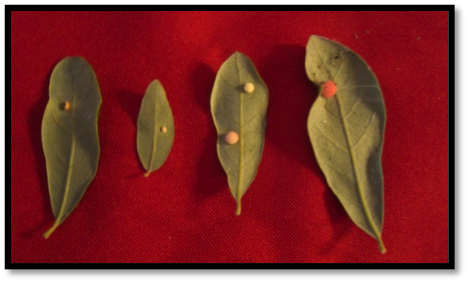 For example, in the South galls found in live oak trees are caused by the gall wasp. Unlike crown gall, the presence of these other galls is usually not serious. For this reason correct identification before taking action is critical. A consulting rosarian can help correctly identify crown gall in roses. (See www.houstonrose.org for a list of consulting rosarians). Disease Process. The disease-causing bacteria can only get into the plant through fresh wounds (less than 24 hours old). No wound = no crown gall. 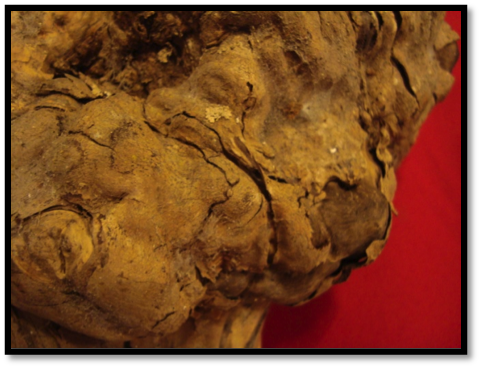 Agrobacterium tumefaciens is drawn to wounds in the plant like metal to a magnet. A wounded plant sends out chemical signals that the bacteria detects and move toward. Once the bacterium enters the fresh wound it attaches itself to injured plant’s cells. The bacterium causes the cell to create unusually large amounts of plant hormone leading to tumor formation. While galls can appear within weeks of infection, latent infections have developed into galls as late as 3 growing seasons from exposure. Galls are a nutrient-rich environment for further bacterial growth. With age, galls become more woody and barky and can eventually girdle a stem. As galls grow the exterior surface cracks releasing the bacteria which falls to the soil surface. The pathogen is then disseminated by splashing rain, irrigation, pruning tools, root-chewing insects (nematodes, grubs, etc.) and propagation. Tumor development tends to start 2 to 4 weeks after infection at temperatures above 68⁰ F. Below 50⁰ gall development stops, above 92⁰ it slows dramatically. As galls grow, plants often become stunted, weak and may eventually die because galls interfere with the movement of water and nutrients between roots and leaves. As galls expand in size, they crush plant tissue – constricting the flow of water to the upper parts of the plant by as much as 60%. Plants become stunted and leaves may become undersized. Infected plants become more vulnerable to environmental stresses such as winter injury, heat, and drought. Plants heavily infected with galls eventually fail to respond to fertilization. Crown Gall and the Nursery Industry. Wounding opens the door for crown gall bacteria to enter the plant. These wounds occur during grafting, pruning, planting and cultivation. Opportunities for wounding happen in the production, harvesting and processing of grafted roses – where the potential for wounding occurs throughout the production process. In field-growing operations, cultivating practices including mowing and disking for weed removal, can create wounds, opening the plant’s door for the bacteria to enter. Because crown gall bacteria can be spread on tools used to make grafts and pruning, large losses can occur in nurseries, where entire infected plantings may have to be destroyed. Prevention starts with clean, careful propagation methods. Grafting knives should be sterilized frequently with alcohol to kill bacteria and new grafts wrapped to reduce the risk of infection. Production facilities often soak and clean propagation areas with bleach solution to kill any bacteria that may be present on propagation surfaces and equipment. Cuttings taken from infected plants may also develop galls. Crown gall can also be spread by infected nursery stock from uncertified sources. Secondary spread then occurs through pruning at the retail level, particularly when galls are removed with the same cutting tools used for pruning. In grafted roses, research done by the National Institute of Agricultural Research in France indicates that rootstocks Dr. Huey and r. multiflora were the rootstocks most resistant to crown gall bacteria. The important Role of Site Selection. Researchers at the University of Delaware found crown gall to be more prevalent in heavy soils and soils where water stands for a day or so. In agricultural settings, crown gall has appeared on budded apple trees planted in fields where grape, peach and rose crops had seen heavy infection in prior years. Crown gall is not as common in acidic soils leading some to believe that soil pH could play a role in limiting the disease. The planting site should be one with well-drained soil. Heavy clay soils should be tilled prior to planting with the addition of 3 inches of aged compost. Field Management. The only useful method of treating soil for the crown gall pathogen is with heat. Soil solarization has been effective in sandy loam soils by placing a thin plastic film over moist soil to capture energy from the sun and heat the soil to kill the pathogens, although temperatures must reach 140⁰ for 1 hour or 160⁰ for 30 minutes to achieve control. Solarization of heavy clay soils has not provided consistent results and its efficacy is questionable. Soil solarization is probably not practical for the home gardener. The University of California-Davis has tested various products that fumigate the soil; however they determined that while fumigation of the soil reduced the population of bacteria it did not control the disease. Control in the Home Garden. There is no known cure for crown gall disease. The best control is prevention. Dig up and destroy heavily infected plants removing as much of the root system as possible. Do not compost infected plants. 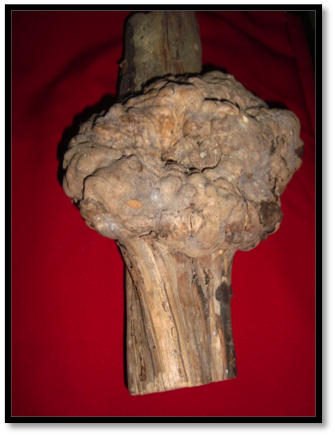 Where only a few galls are present above ground, cut off and destroy the stems on which the tumors occur. Disinfect pruning shears between cuts with a solution of 1/4th cup of household bleach mixed with 2 ¼ cups of water. The University of Kentucky also recommends disinfection using solutions of 70% alcohol to 30% water; or, 70% Lysol to 30% water. Avoid wounding of any kind, especially wounds that occur during transplanting. Control soil-borne chewing insects (e.g. grubs) by treating those with a soil insecticide. Do not purchase plants that have suspicious swellings or visible galls. Plant grafted and budded roses such that the graft/bud is well above the soil line. 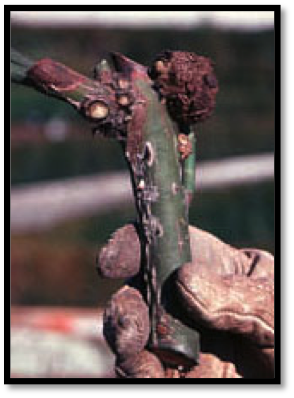 Some recommend protecting bare-root grafted roses from crown gall infection during planting by dipping the roots of the bare root plants or drenching the potted plants with the biological control, Agrobacterium radiobacter K84 or K1026. These beneficial bacteria produce an antibiotic that protects and occupies wound sites keeping crown gall bacteria from getting into the plant. K84 and K1026 are contained in products sold under the trade names NoGall™, Galltrol-A®, and Gallex®. These products are only effective if applied within 24 hours of the plant being wounded. If the bare root grafted plant is already infected with crown gall, treatment with K84 and K1026 will be ineffective. There are no registered chemical treatments that effectively control crown gall in infected plants currently available in the United States. Conclusion. Thankfully, most gardeners will never see an outbreak of crown gall in their rose gardens. “This is one of those garden diseases that comes in cycles….we see it, it goes away for years, and then surfaces for a brief period,” explains Chamblee. What Mark says makes sense. Over the last 15 years and in visiting hundreds of gardens across the country, I have only seen crown gall one time. By being aware of the symptoms and following a few simple precautions gardeners can vastly reduce the risk of an outbreak of crown gall in the garden. Dear Gaye Hammond Interesting top pic.- do you happen to have a section of one of your woody crown galls? (Wonder if I've got one from the Jurassic but no-one seems to have x-rayed a modern one) Yours Ed J. We found crown call on a Julia Child's. We have removed the rose and surrounding dirt. Should we treat the surrounding roses bushes? What should we use? There are no chemical cures for crown gall. Best recommendation - remove the plants and as much of the surrounding soil as reasonable. 10 years ago I purchased a Napolean rose bush from an area that represented sentimental value to me. When I got ready to plant it I noticed a huge gall on much of the root system. In an effort to save this rose bush, I washed the soil off of the roots and cut the gall completely off. I then soaked the remaining roots in a weak water/bleach solution. Afterwards I applied a very thick layer of NEOSPORIN (clear) and planted the rose bush. My rose bush is still alive and extremely healthy with continuos blooms throughout the year. I am not certain whether this would work for other trees plants etc. but it has worked for me. True story!! That sounds very exciting and I will give it a go with my apple tree that has some gall. Seems in Australia we need a prescription for such ointment. How long did you leave the Neosporin before you planted the rose again.